Like many other holidays, people have their own Easter traditions. Many of us share the egg hunt, the baskets for children, and then there’s Easter meal. Some of us share an Easter breakfast and others have Easter dinner. Then there are those who have both a traditional Easter breakfast and a traditional Easter dinner. 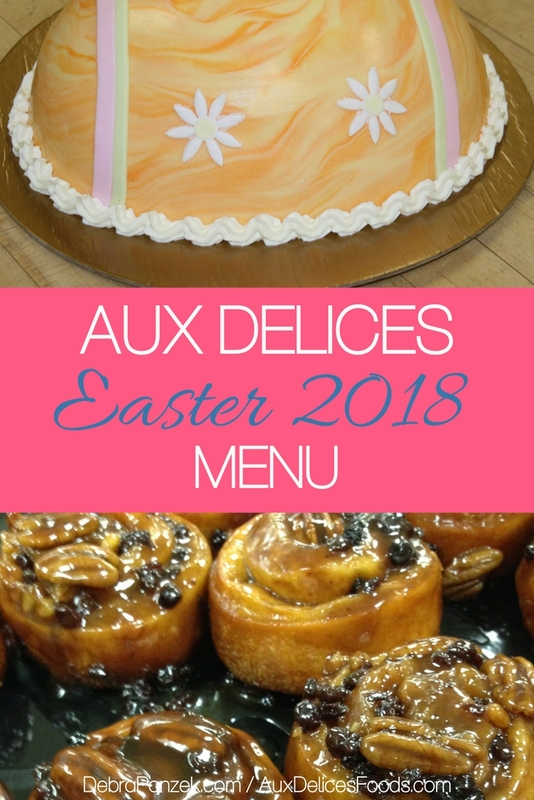 No matter which meal you have with your family, friends, and guests, the Aux Delices Easter 2018 menu has something for you to enjoy. Leave the mess and the hard work out of your holiday celebration by having Aux Delices cater your event with the Aux Delices Easter 2018 Menu. Start your Easter off right with one of the some of the most popular breakfast pastries from Aux Delices. One of the best pastries for Easter is the decorated Easter bread. You can also order some of the more common pastries like pecan sticky buns, blueberry crumb muffins, croissants, ginger scones, hot cross buns, or apple dartoise. Aux Delices also has other favorites like a fresh fruit salad or a ham and gruyere quiche. With a little help from Aux Delices catering, you can have a gourmet breakfast at home on Easter. As the day goes on, family and friends will occupy their time with egg hunts and other fun Easter activities. But while they wait for dinner, or even just before dinner, you can serve some amazing bites. Things like baked brie en croute, pigs in a blanket, or shrimp cocktails. One appetizer that many people love, and some even attend events specifically for are crab cakes. Aux Delices Easter menu has crab cakes that can be ordered by the dozen. For a lighter taste, there is also a little gem lettuce salad with radishes, spring peas, and feta cheese. Once the small bites are finished and it’s time to serve your traditional Easter dinner, Aux Delices has everything you need ready to serve. For those guests who like seafood, you can order roasted salmon. Not everyone is a seafood fan, and that’s fine, there’s also sliced filet mignon which can be ordered by the portion. All natural chicken breast is another popular dish that many people enjoy. 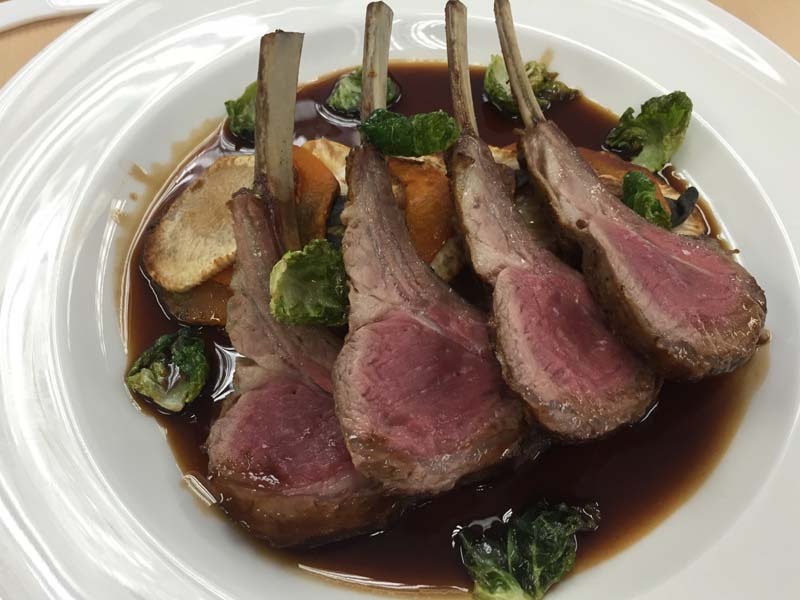 Then there are the more traditional options like a rosemary and garlic crusted rack of lamb or an Easter ham. The ham is provided by Garrett Farms and is spiral cut with honey and tangerine glaze. The ham is also ordered by the whole ham, not the pound. Another great dish you can add to your Easter meal is ready to roast pork crown roast. The pork crown roast comes raw but already glazed with an orange-dijon glaze. A meal wouldn’t be complete without the side dishes. A good side will elevate the flavor of the main course and add more flavor to the meal. Veggies are common sides and can be ordered from Aux Delices like roasted broccoli, honey roasted carrots, haricots verts, and a vegetable melange. The melange comes with asparagus, English peas, pearl onions and baby carrots. Potatoes also make great sides like potato gratin or thyme roasted creamer potatoes. Now that dinner has been served it’s time for dessert. Of course, on Easter, desserts come with a fun theme. 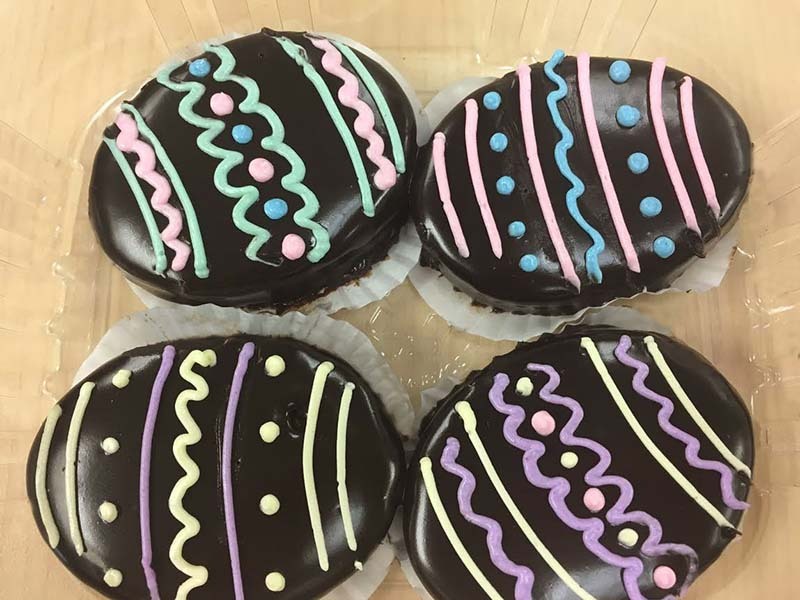 Aux Delices has a pack of four chocolate espresso Easter petit fours, homestyle Easter egg cake, spring macarons, decorated Easter cupcakes or Easter ricotta pie. You can also order double-dipped chocolate strawberries or a 6-inch strawberry shortcake. All of the desserts will close out your traditional meal on a deliciously sweet note. All Easter orders need to be submitted before 5 pm on March, 29th. This will ensure that your order is ready to go for your Easter celebration. You can even order online at Aux Delices to make things even easier.